Though I have fresh, bright spring colors on my mind, I want to highlight one of my favorite moody trends before I’m knee deep in all things bright and white. I’m guilty of following the crowd and painting most walls in my home white or light gray. There’s much to be said for a crisp, white wall. White is popular for many good reasons, but let’s not forget about the other end of the spectrum. For as many reasons as there are to paint a wall white, there are just as many reasons to go bold. If you’re feeling scared to pull the trigger on these dark hues, let me try to convince you. When you have a house with a white/neutral color pallet, painting a room a dark color can provide amazing contrast to the overall feel of your house. It will break up the space and ease your eye from the otherwise bright, white walls surrounding it. Also, a dark wall color will highlight décor such as white bedding, furniture, trim, and floors. With our kitchen and living area being light gray, I felt that our office needed more of a bold color to break things up. Painting the upper part of the walls dark blue, it breaks up our open space and adds interest and boldness, which is felt throughout the rest of the house. Bold walls make other colors pop in a room. By adding a bright sofa or chairs, colorful painting, or a vibrant rug, a dark wall color will highlight those pieces instead of taking away from them. A dark gray or black paint will be your best choice if you’re looking to highlight pops of color because gray and black are the most neutral colors unlike green and blue. It’s like your mother always told you, black goes with anything! This sounds backwards and like such a lie, but I promise that a dark wall color can make a small space appear larger. It’s not a scientific study, but a psychological one that debunks the myth that you must paint a wall a light color to make it feel bigger. This article quickly explains the study as to why dark walls make a small space feel larger. To summarize, dark objects appear farther away than light objects to the human eye; therefore, dark walls in a small space appear farther away from you making the room appear more spacious. It’s common to see dark walls in powder rooms and small bathrooms. The dark hues will expand the small walls making the space feel cozy yet more spacious. The same theory holds true for small offices, dining rooms, and living rooms. When I think of a cozy nook or comfortable, inviting room, my mind often goes to more moody colors. Just think about being cozied up on a rainy day, reading a book, and sipping on your third cup of coffee. Do you image the walls being white, bright yellow, or light blue? Or do you image a forest green, dark neutral blue, or warm charcoal? Dark walls can be cozy and inviting in many spaces like an office, bedroom, or reading nook, and I’m all about that cozy life! 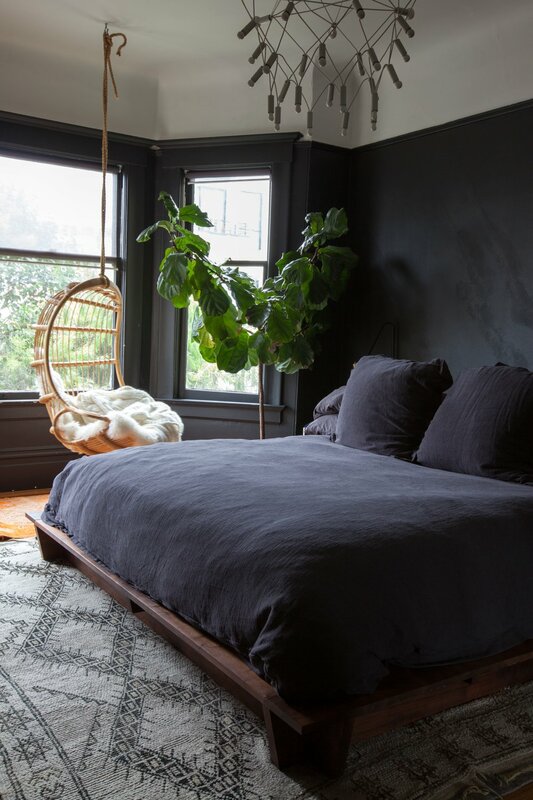 If you want even more moody interior inspiration, check out my Pinterest Board dedicated solely to this dark hue movement. It can just be an accent wall, small corner, or a powder room, but I encourage you to not miss an opportunity to add a bold color to your home. After all, it’s just paint. I tend to stick with white walls (or very light) but lately I’ve been seeing more dark walls on shows like Fixer Upper and it is SO CLASSY. I love this! I love color on walls (I think white walls are so pretty, but not for me) and I really love bold colors…even if it’s just an accent wall with a bold color. 🙂 I love all these examples! It makes me want to repaint a room. I have always been afraid to go dark with paint colors. These rooms look beautiful and I might have to try one or two walls. Before reading this post I would have never considered having a dark wall. I’m a light and bright wall type of person. However, I really like the cozy feeling the dark colors you selected provides. And the contrast with white ceilings look great. Loooove darker walls like these! Makes the rooms so cozy and romantic! I love this!! I’m not normally someone who likes dark colored walls but I like a dark feature wall. In one of my old apartments we had a door connecting the living room and the bedroom and it was rounded so we painted that wall dark brown and the door lime green, then the rest was white. Sounds weird but it looked awesome! I think if done right bold, dark colors can look awesome! I love dark paint colors! They lend an air of sophistication to any room! I love that there is the contrast between objects and its backgrounds in every room! It adds a bit of drama and such liveliness. So many people are opting for all white, and I’m getting a bit bored with that! Who made that amazing painting of the woman’s profile in the cover photo?